Since the end of September, Canada Lithium Corp. (TSE:CLQ), (PINK:CLQMF) stock price is in an almost constant upward direction. The latest news from the company and some recent publications about the explosive perspectives in the electric cars business and its related infrastructure resulted in a huge rush for the shares. On Friday, when the last bids on CLQ on the Toronto Stock Exchange were made, the shares of Canada Lithium Corp. deposited a new 52-week high. CLQ closed the session at $0.78 per share, rising up by 4%. The volume traded was more than 3.02 million shares. This was almost five times the average volume for the company. In the beginning of this week, while investors on the Toronto Stock Exchange enjoyed the good development of the company and its stock staring without any bids, on the American OTC market the trading activity was still strong. Yesterday, CLQMF closed the market with a 2.01% price increase. According to the plans and on the positive feasibility study, the company will start the construction of an open pit mine and a processing plant, capable of producing by late 2012 approximately 43 million pounds of battery-grade lithium carbonate. In support of investors' optimism and appreciation of the upward direction of Canada Lithium Corp. shares, came also the latest publications on the emerging electric cars business and its related infrastructure. 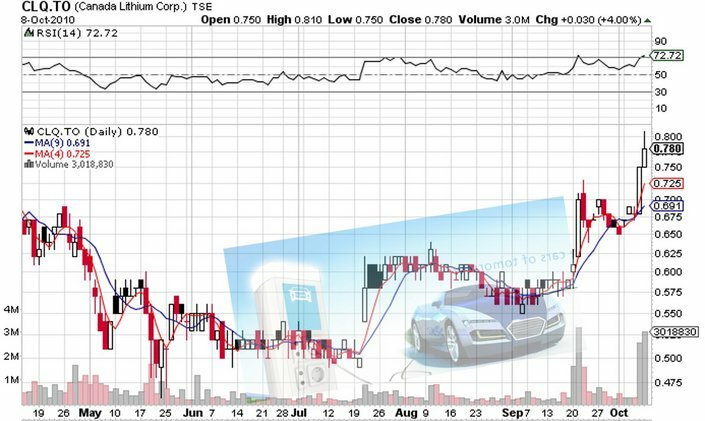 Referring to the company's statement that it has an agreement with a Japanese metals trading firm to market part of Canada Lithium Corp.'s products in China, Korea and Japan, it is not difficult to explain that this month the stock price of Canada Lithium Corp. is moving almost constantly upwards, even without any further news. People have to remember back when oil was a new energy. Some people had no idea the importance it was going to have on our lives, and the way we were going to live. I think that lithium is going to be and has to be the next oil, if you will. don't sell your lithium stocks now, because I think there going to be worth it's wheight in gold.